Some galaxies in the Universe have been observed to have objects at their centre that emit extremely high amounts of electromagnetic radiation and these objects have been called "active galactic nuclei", or AGNs. This radiation can be any wavelength, from the longest, as radio waves, to the shortest, as gamma rays. Galaxies containing AGNs are called "active galaxies". 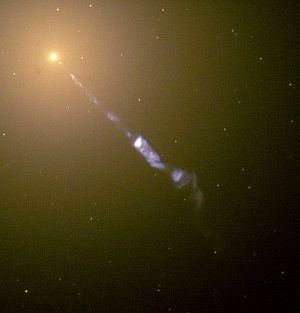 Here we have an image of active galaxy M87. It is emitting a 5,000 light year long jet of electromagnetic radiation (known as synchrotron radiation). Its faint blue colour contrasts quite nicely with the bright yellow of the actual galaxy. The extremely powerful radiation emission of these objects is caused by cold gas being sucked into the central super-massive black hole and being heated up as it does so. As well as these types, active galactic nuclei can be broadly placed into two groups - radio-loud and radio-quiet, the distinction being the prominence and power of the emitted jets. AGNs play an important role in increasing astronomers' understanding of the early Universe. When a study was made of the rate of evolution of these objects throughout the cosmos, it was discovered that there were a lot more of them in the early Universe, both of the radio-loud and radio-quiet variety. As the existence of an AGN relies on the presence of a super-massive black hole, this would suggest that these phenomena also were quite numerous in the early Universe - itself a pretty dramatic finding. The other condition for the formation of an AGN - the presence of cold gas needed to be sucked into the black hole - results in the probability that this was far more prevalent back then than now.